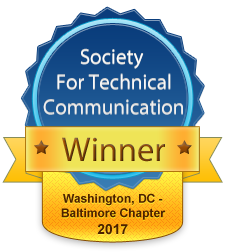 Congratulations to all the winners in the STC Washington, DC – Baltimore (WDCB) Chapter Technical Communication Competition! The winners receive their awards at the Competition Awards Celebration and Networking Night on 18 April 2018. Winners of our chapter competition are entitled to display the appropriate competition award badge to promote their award. Download the badges. The first column shows the entry statistics, the second column shows the number of awards. 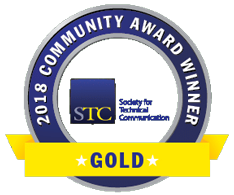 Winners of the 2017-2018 chapter and regional competitions will be announced at the STC Technical Communication Summit in May. 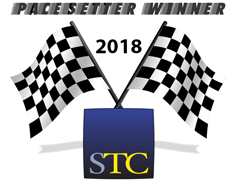 You can be a competition sponsor by donating to help pay for meeting location space, awards celebration expenses, help a student attend the awards celebration, and so on. Read about our Partnership and Sponsorship program. Donate to the competition using PayPal—click the PayPal Donate button. We are pleased to present the winners for our chapter competition. The first column shows the entry title, the second column shows the contributors to the entry, and the third column shows the name of their company. An entry that wins an award of Distinguished Technical Communication is clearly superior in all areas. The entry contains no major flaws and few, if any, minor flaws. It applies the principles of technical communication in an outstanding way, particularly the way that it anticipates and fulfills the needs of its audience. An entry that wins an award of Excellence consistently meets high standards in all areas. The entry might contain a single major flaw or a few minor flaws. The entry demonstrates an exceptional understanding of technical communication principles. An entry that wins a Merit award consistently meets high standards in most areas. The entry might contain a small number of major or minor flaws, but it still applies technical communication principles in a highly proficient manner.